Deer's Glade Caravan and Camping Park01263 768633work01263 768328fax Touring & Camping ParkDeer's Glade Caravan & Camping is an award winning family run park which opened in 2004, open 365 days a year! It is a quiet, rural caravan park & camping site set in a beautiful woodland clearing in North Norfolk, UK, - a perfect venue for a relaxing holiday in the countryside! Sister Site – Deer’s Mead (Adults Only, 1.5 miles away). complete with 'Super Pitches', open from march to October every year. Minimum 2 nights booking & 3 nights booking on bank holiday weekends. Arrivals from 2pm, departures by 12 noon at peak times. Wifi access, A natural play area for children, A well stocked fishing lake, Dog walking routes, Dog sitting available, Farm animals, Cycle Hire, Disabled facilities. Easy site access from a straight road. Available locally are swimming, tennis, gyms & cycle hire. The beach is only 5 miles away. Please follow us on twitter @DeersGlade or on facebook. 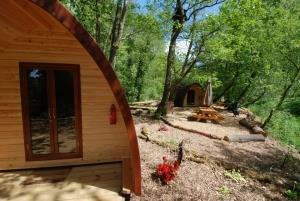 Deer's Glade Caravan & Camping is an award winning family run park which opened in 2004, open 365 days a year! It is a quiet, rural caravan park & camping site set in a beautiful woodland clearing in North Norfolk, UK, - a perfect venue for a relaxing holiday in the countryside! Golf - 5 miles away. Leisure club - 5 miles away. Beach - 5 miles away. Children welcome from any age. From Norwich take the A140 towards Cromer. 5 miles beyond Aylsham turn right towards Suffield Green, signposted, White Post Road. The site is half a mile on the right. From Kings Lynn. Take the A148 towards Cromer; turn right onto the B1436 towards Roughton then join the A140 towards Norwich. 2 mile beyond Roughton, turn left towards Suffield Green, signposted, White Post Road. The site is half a mile on the right. Take the bus from Norwich to Cromer - alight at the 'Hanworth old post office' stop and walk down the road to the park. Take train from Norwich to Sheringham, alight at North Walsham, Gunton or Cromer and catch a taxi to Deer's Glade.